Named after renowned Obstetrician and Gynecologist Dr, B.L. Kapur, BLK Hospital is one of the biggest standalone private Hospitals in the National Capital Region of India with a capacity of 700 beds including 125 critical care beds. The hospital has an outpatient services area spread on two floors with 57 consultation rooms. BLK Hospital is one of Delhi premier multispecialty institutes that deal in General Surgery, Ophthalmology, ENT, Dentistry, Pulmonology, Intensive Care and Orthopedics (at BLK Centre for orthopaedics), Gynaecology, and Paediatrics. The hospital offers state-of-the-art tertiary care and is a symbol of dedication and quality medical services. BLK is a synonym of legendary care as is the reputation of Cancer Treatment offered by the Hospital by uniting surgeons, medical oncologists, radiation oncologists, radiologists, pathologists, Interventional Radiologists, neurooncologists. It offers a non-invasive outpatient procedure to treat and remove cancerous and non-cancerous tumors and lesions throughout the body, including vascular lesions and functional disorders. 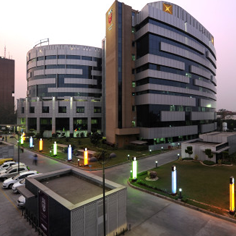 BLK Centre for Bone Marrow Transplant (BLKBMT) is the largest in India and amongst the biggest in Asia. It offers both allogeneic and autologous transplant using bone marrow, peripheral blood stem cells and cord blood stem cells for various benign and malignant disorders. The Heart Team comprising of Cardiac Surgeons, Cardiologists, Intensivists, Physicians, Cardiac Anaesthesiologists and Intensive Care Experts all work in synergy providing the best possible outcomes in cardiac and cardiovascular segments.